I hadn’t meant to go on a Jules Verne kick, but David starting spotting ads for the DVD release of Brendan Fraser’s Journey to the Center of the Earth. Ads with T-Rexes in them. Because I am physically incapable of watching any sort of remake or adaptation without seeing the earlier versions first, I had Netflix send us the 1959 version (it’s in color, unlike the still above, by the way) starring James Mason and Pat Boone. In a few years, David probably won’t put up with those kinds of shenanigans, but for now he’s willing to watch what I order as long as the dinosaurs are there. And he’s enough of a geek that he enjoys watching various versions as much as I do. I’ve never read the Verne novel, so I didn’t know what to expect story-wise. I guess I was hoping for something like At the Earth’s Core or a subterranean version of The Lost World, but Journey is a lot more subdued than those two. Not that it’s a quiet or boring movie by any means. It’s just that the excitement comes from its sense of mystery and the drama between characters more than it does from giant monster attacks. I am absolutely okay with that; it’s just not what I expected. The movie opens with Edinburgh’s celebrating the recent knighthood of one of its citizens, Professor Oliver Lindenbrook (James Mason). Lindenbrook is a geologist, so as a congratulatory gift, one of his students (Pat Boone) gives him a piece of volcanic rock he picked up in a curio shop. The rock is heavier than it should be, so Lindenbrook starts testing on it and finds hidden inside another, denser kind of rock. What’s strange is that the interior rock is only found in Iceland, while the volcanic rock comes from the Mediterranean. Chipping away at the exterior shell, Lindenbrook discovers markings on the Icelandic rock and eventually cleans it up enough to see that it’s really a stone plumb-bob. The markings are actually writing, so Lindenbrook deciphers it and learns that it was written by a scientist named Arni Saknussem who disappeared a while back while searching for Atlantis. Lindenbrook deduces that that Saknussem discovered another world beneath ours and managed to get the plumb-bob message out before he died. If that sounds overly goofy, it’s because I’m forgetting some details. It’s all believable in the context of the film. 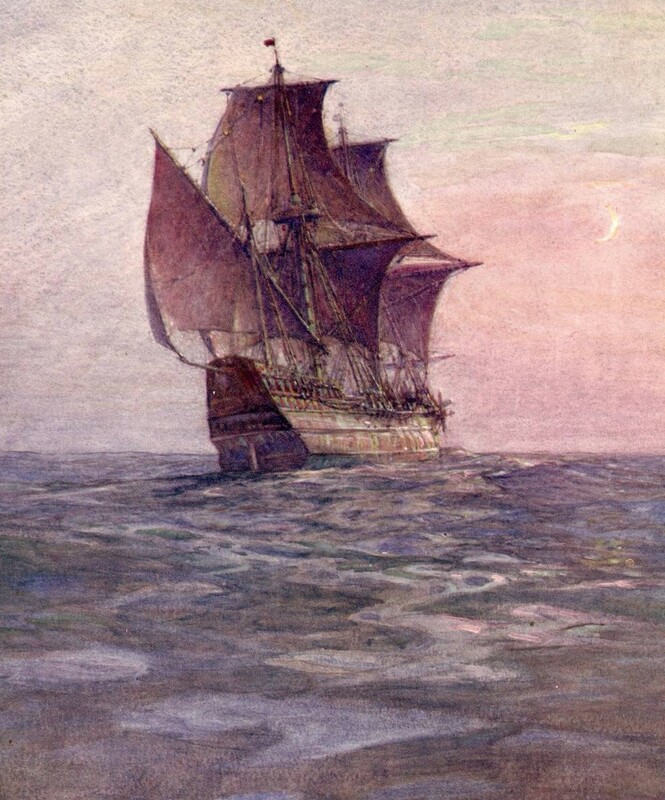 Lindenbrook transcribes the text on the plumb-bob and learns that it reveals the entrance to the world below. He sends it to Professor Göteborg, another famous scientist who lives in Sweden, for verification. When he doesn’t hear back from Göteborg, Lindenbrook writes again. This time he gets a response, but not from Göteborg. The University in Stockholm writes to let Lindenbrook know that Göteborg has disappeared. Lindenbrook estimates the date of Göteborg’s disappearance as being approximately when the first letter would have arrived. It’s a lot of set-up, but it goes by quickly and it’s made enjoyable by Mason’s suaveness and the sheer, boyish charm of Pat Boone. Boone’s Alec McKuen is a good guy, but he’s not as irritatingly fresh-faced and squeaky clean as I’m imagined a Pat Boone character would be. He’s in love with Lindenbrook’s niece Jenny (played by Diane Baker, who apparently guest-starred in every single TV show made in the 1960s and now plays House‘s mom) and a lot of the first act is about their relationship and whether or not unwealthy Alec will ever be in a position to propose to her. This is a 1950s movie about the 1800s, so obviously their relationship is pretty chaste, but there’s some hand-knee action that shows that Alec isn’t above trying to cop a nineteenth century feel. Also, Alec is the first one to start shedding clothes when things get bad below ground, and there’s a hilarious scene towards the end with Naked Alec, some nuns, and a sheep. Act One is fun, but Act Two gets awesome when Lindenbrook and Alec rush off to Iceland to try to beat Göteborg to Saknussem’s secret entrance. There’s murder and betrayal as Göteborg and one of Arni Saknussem’s descendants each try to find the underworld before Lindenbrook and Alec. During all the intrigue, Lindenbrook and Alec meet a local farmer named Hans who joins their expedition, but doesn’t speak English. That necessitates their including a translator in their party, so they also bring along a woman played by Arlene Dahl. Peter Ronson as Hans is the coolest character in the movie. I love that he speaks Icelandic the entire movie, but never comes across as anything less than intelligent and capable. It would’ve been so easy to make him a comic figure suitable only for lugging around heavy packs, but Hans is an indispensable member of the team and everyone acknowledges it the entire way through. He’s made even cooler by his love for his pet duck Gertrude whom he brings along on the expedition. Arlene Dahl’s character is also wonderful. She’s smart, capable, and never tries to use her gender as a crutch to get her out of something. Lindenbrook needs convincing that she can carry her own weight, but she more than proves herself. She’s also, incidentally, heart-breakingly beautiful. The only thing I didn’t like about the movie were the special effects on the dinosaurs. Putting fake back-sails on live reptiles and calling them dimetrodons is cheesy. Not that cheesy can’t be fun and cool. 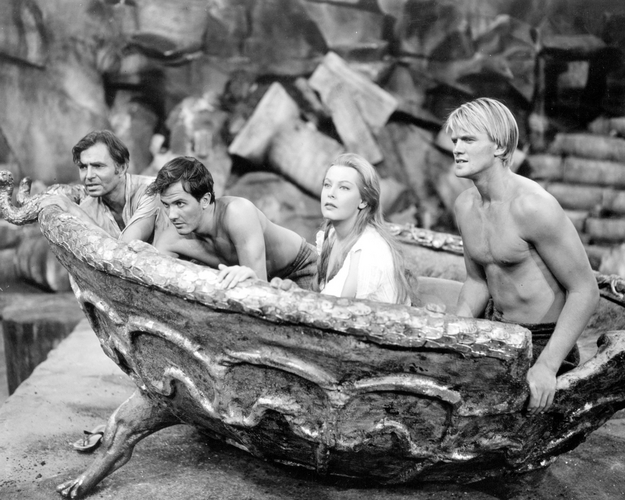 I appreciate it, for example, in schlock like the 1960 version of The Lost World where the whole movie is cheesy. But the rest of 1959’s Journey to the Center of the Earth doesn’t give off that vibe. It’s awesome in all other ways and it needs awesome dinosaurs too. See? Chappelle knows Aquaman’s no superhero. There’s been a lot of talk amongst Aquaman bloggers (all three of them) this week about an interview Dan DiDio gave to the LA Times. When DiDio mentioned the top five, key DC franchises, interviewer Geoff Boucher noticed the absence of Aquaman from the list. 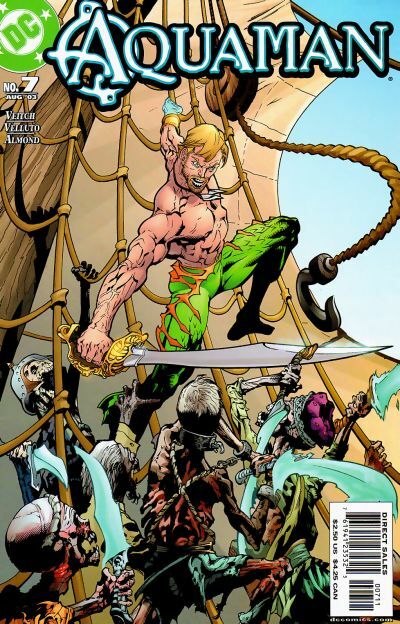 DiDio replied that he thinks of Aquaman as a second-tier character and then followed up with why he believes that is. He calls it The Aquaman Problem. You have to remember, a lot of our fan base has been reading comics 20 or 30 years now. They’ve see a lot of stories and a lot of things. We’re always trying to find a way to give them something new but also give them exactly what they want. There’s a lot of challenges with some of our characters. Like Aquaman. 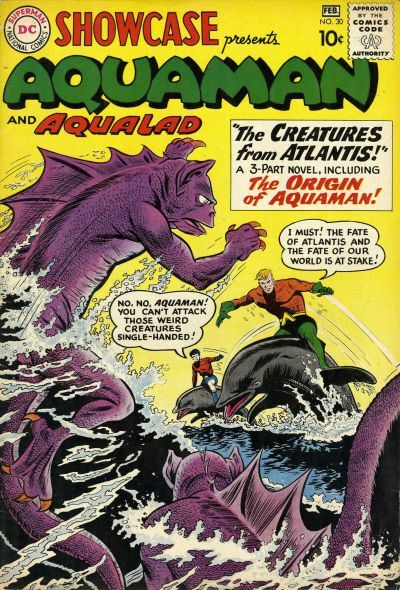 Most of people’s memories of Aquaman are actually from cartoons in the 1960s and 1970s than they are from the comics. We do have a small loyal fan base, they are people who enjoy that comic, [but] Aquaman has never been an upper-tier success. The challenge is how to make him that. There have been so many twists and turns. It’s left the character confused; we try to build a strong foundation for the characters and Aquaman does not have that right now. We have to get him back to a core conceit so we can build him back up again. We need to build on what is recognizable and draw people back in. And everybody wants to try to take on the character. 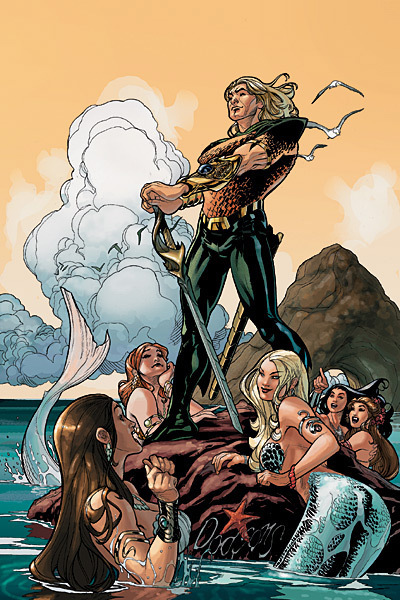 I have a running joke: In all my dinners with the talent at conventions, I get three or four writers who will lean into me and say, ‘I know how to fix Aquaman.’ Everybody says that. It’s become a cause célèbre. It’s a running joke but, really, it’s not a joke because I know people do love the character. We’re going to be very cautious from this point forward because I want to make sure it’s perfect. I don’t want to add to the confusion when we take another pass at him. That’s the problem. That’s the Aquaman problem right there. You go to people and the audience is split. It’s split by generation gap. A lot of guys want the long hair and the harpoon hand, a lot of guys want the green gloves and the orange vest. It’s hard to reconcile the two. And a lot of times if you try to blend, you compromise both. 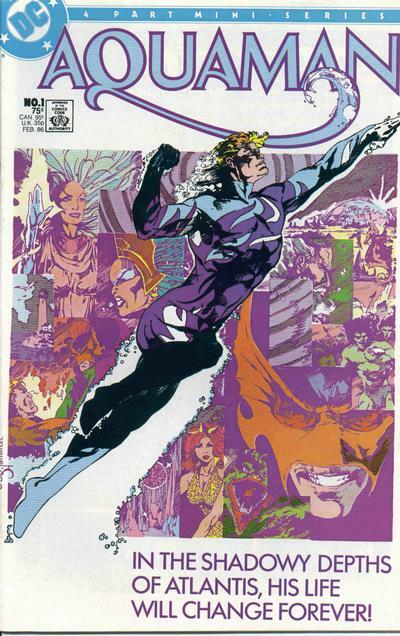 No, really; no matter what version of Aquaman you want to look at – and, to be honest, my personal preference is that Atlantean Royalty one with the hook – there’s all kinds of potential there. You could go all-out mystical with the “lost civilizations under the sea” angle, you could go scientific exploration considering how little we know what’s going on in 70% of the planet. You could point out that, in order to be able to swim in the depths of the oceans, Aquaman has to be pretty strong, and that his sight must also be pretty keen to be able to make out things in all that murk. Add that to his telepathy, and he’s a one-man X-Men… one that could, if you so choose, be at the very least a Prince of Atlantis. There’s so much potential in the Aquaman concept, whichever one you choose, that it should be impossible to fail. Admittedly, that whole “He talks to fish and can swim really fast” thing doesn’t help his case; we all dig Michael Phelps – who, interestingly enough, can also talk to fish, although he likes to keep that quiet – but no-one really wants to see him in tights fighting crime, you know? And I’d argue that no one really wants to see Aquaman fighting crime either. At least, not full time. There’s so much potential for Aquaman, but I don’t think much of it has anything to do with being a superhero. 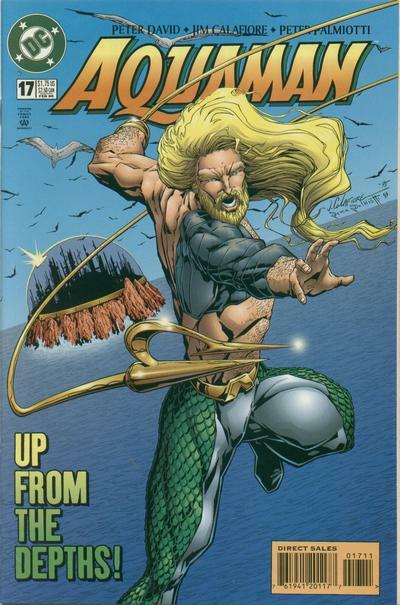 Aquaman belongs to a different genre: fantasy or scifi; maybe both. And that’s probably why superhero fans haven’t taken to him in a big, popular way. Maybe they never will. That’s not going to stop DC from trying though. DiDio mentions in his interview that he’s written an Aquaman story for an upcoming Christmas special and Once Upon a Geek has a whole post on the future of Aquaman, including his appearance in DC’s next big event comic Blackest Night. Once Upon a Geek also speculates that Geoff Johns & Ethan Van Sciver have eventual plans for an Aquaman: Rebirth mini-series. Me, I’ve got no idea. And in spite of my comments about his not really being a superhero, I’ve got no ideas about how to fix him either. I mean, I know what kind of take on him I’d love to read, but I’m not convinced that it would make him a popular character. And frankly, my knowledge about what’s been tried so far is so poor that I’m not even sure I wouldn’t just be repeating something that’s already been done. But it ain’t my job to fix Aquaman (something – in the spirit of the holiday – that I’m very thankful for). I don’t envy those whose job it is, but I’ll be impatiently waiting for them to figure it out. Now that my friends in the US have had some time to sleep off their turkeys, how ’bout lets catch up with the Sub-Mariner? I’m a bit leery of totally buying into this story because ComicBookMovie.com is the only place I’ve read about it. You’d think one of the larger sites would’ve covered it if it was legit. But, they quote Variety as their source (as opposed to some nameless “insider”), so maybe there’s something to it? I don’t know. It feels weird. 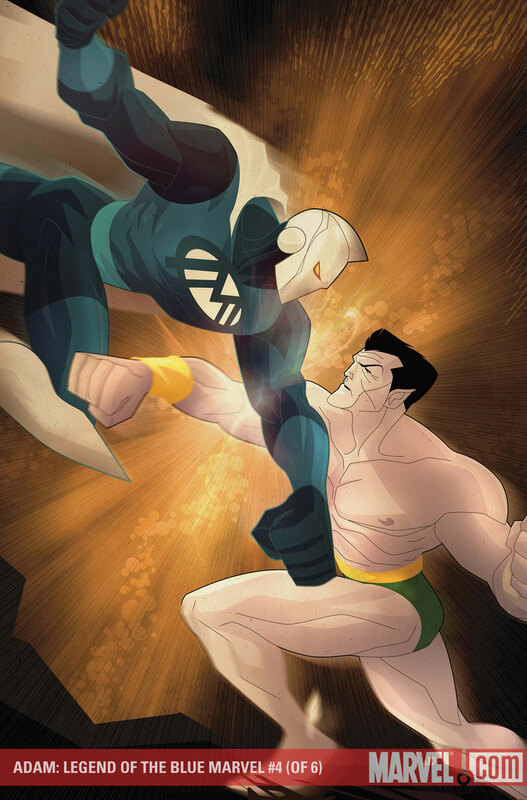 Here’s where Namor will be appearing in February from Marvel. 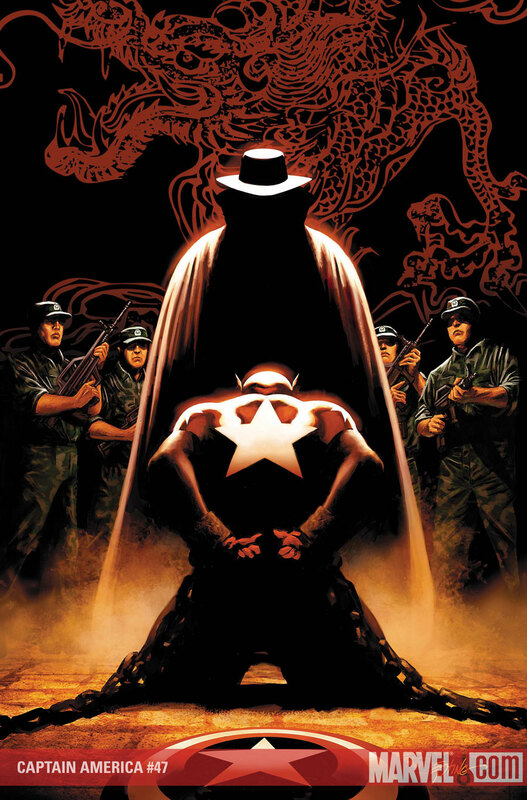 The dreaded Anti-Man has returned…the Mighty Avengers barely stopped him before, and now he’s stronger than ever! 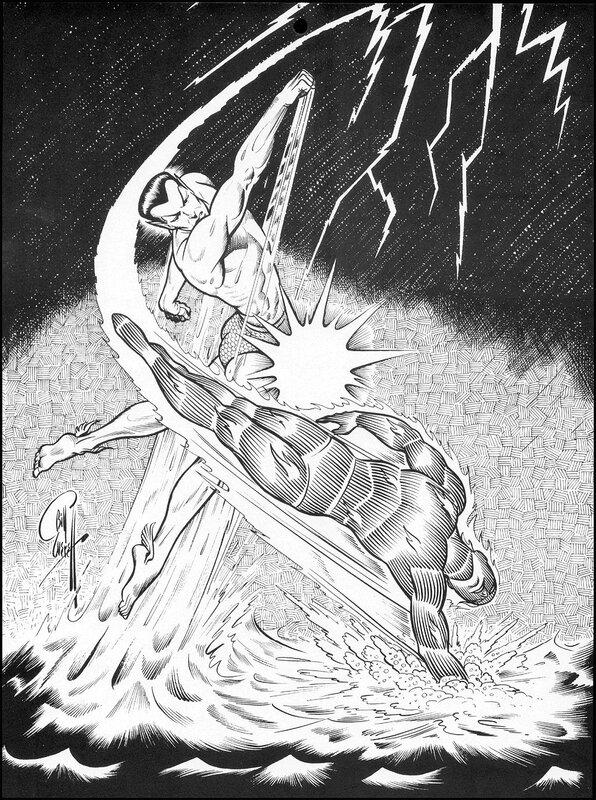 But why is the Blue Marvel, the only man who has ever managed to defeat the villain, rocketing to the bottom of the ocean? Guest-starring NAMOR! Guess what Emmy nominated, Eisner Award winning Jeph Loeb and superstar fan fave Ed McGuinness have for you THIS month?! 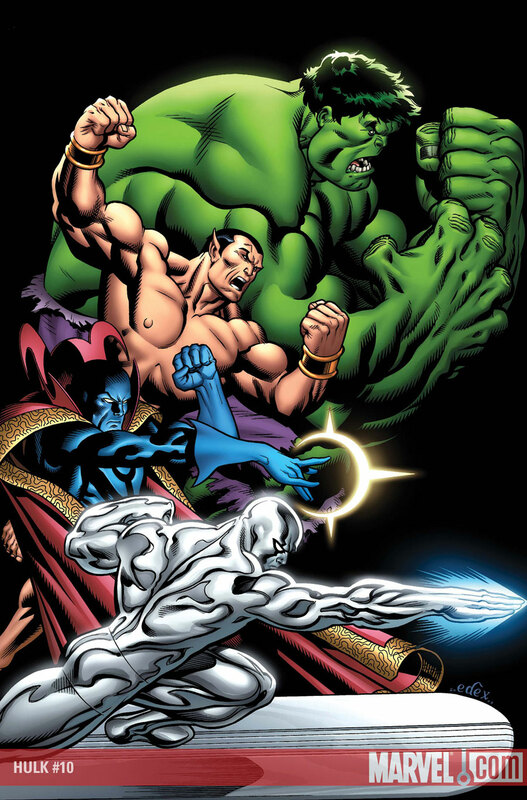 There was a time when the world’s mightiest heroes got together to fight foes too great for them to handle all by themselves. No! Not the Avengers! The other guys: HULK! 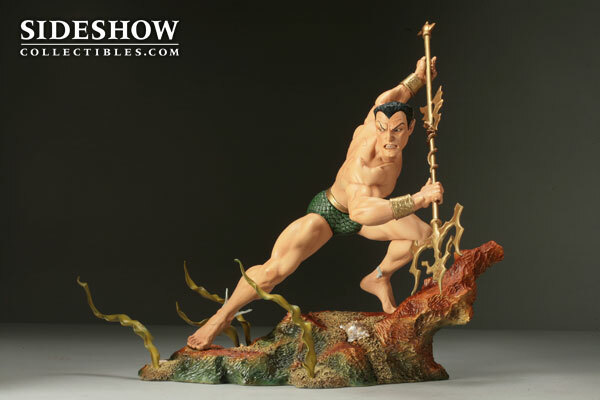 NAMOR! SILVER SURFER! DOC STRANGE! The original Defenders are back! But what terrible threat could bring them together again? How about THE OFFENDERS! RULK! TIGER SHARK! TERRAX! BARON MORDO! If you have to buy ONE comic this month — be sure to by TWO copies of HULK! I’m so bored with Secret Invasion, but Marvel’s figured out how to get me to buy at least the initial one-shot intro to their next big event. 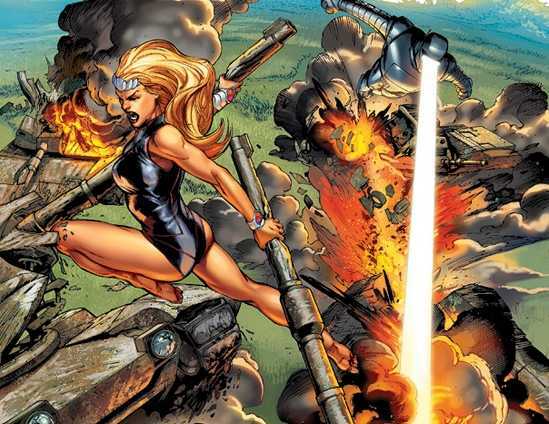 Put Namora and the rest of the Agents of Atlas in it. And Jeff Parker promises that’s just the beginning of the Agents goodness we’ll be getting in the coming year. I know about the new ongoing series, but I wonder what else he could be talking about. I can’t figure out how to embed this one, so you’ll just have to go look. It’s totally creepy and worth it though. Short, too.